Radio is very much still alive besides what some people say! Don’t listen to the naysayers (and there are plenty of them!) Radio isn’t dead; in fact it’s very much alive and kicking. 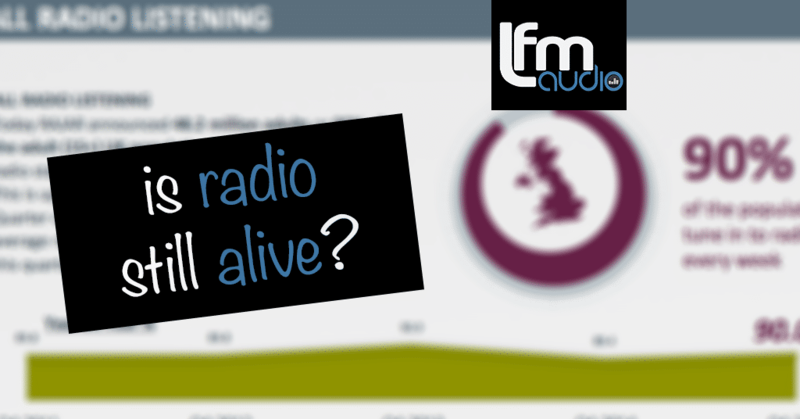 Don’t just take our word for it though, the latest United Kingdom RAJAR report detailing radio trends for the last quarter of 2015 has shown growth proving that radio isn’t going away any time soon. The findings show that 90% of the adult population listens to the radio at least once a week. That’s just over 48 million people aged 15 plus. These listeners use radio for just over an average of 21 hours per week. Not surprisingly, tuning into radio via digital receiver is listeners preferred method, with 56% of the polled respondents choosing digital radio. 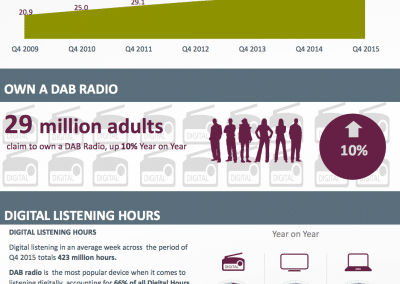 The percentage of listeners who own a DAB radio is up 10% from the same time last year to 29 million. During this quarter listeners spent a total of 423 million hours accessing radio by digital methods. DAB accounting for an astounding 66% of digital hours and an impressive 28% of all radio listening hours. A huge increase has been seen in radio listening via smart phone or tablet with 26% of adults accessing radio be these devices. this is a 20% growth on the same time last year. People in the 15 to 24 year old bracket make up the majority of these, paring the results down to just these ages; the percentage goes up to a noteworthy 41%. 47% of those aged 15-24, & 32% of adult listeners use social media sites to keep up to date with their favourite stations and presenters. So what can be learned by this information? That radio is still a widely accessed platform for people to access music, news and entertainment. Yes the results indicate that some people are moving to digital access, but the growth in this area should be a confidence booster for any savvy producer. By hitting all the key areas, traditional broadcast, digital radio, and great social media, a station can be confident in their listeners innate love of radio for years to come.